Candles are one of the earliest sources of the lights invented to lighten up the dark spaces but they became less useful as more and more light sources were being invented. And these days when we use electric bulbs and lamps for the light gain, candles have become an integral decor and embellishing piece for the DIY home decor at formal and informal occasions as no decor is complete with gorgeous candles and candle holders on the table and mantles of the house. People use lovely candles and adorable candle holders and spent lot money to but the stylish and gorgeous ones. But now you can save your big amount on the candle holders as they are easily attainable from the pallets like we have achieved this stunning DIY pallet candle holder. 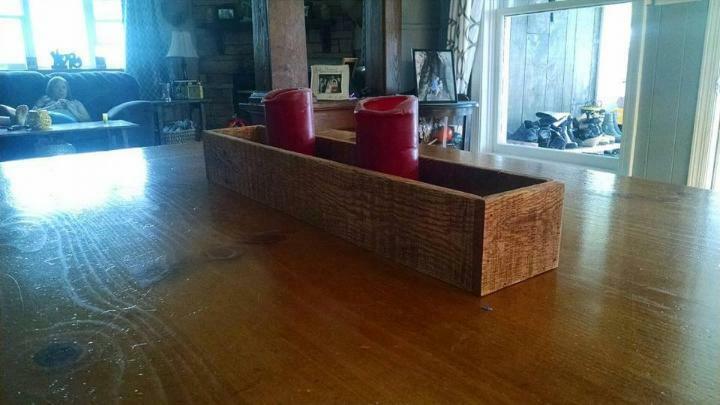 Long pallet slats have been joined together to shape up this rectangular candle holder with slim design to proudly hold the candles in it. Either you display it on the mantle shelf or in the center of the dining table; its rusticity would take the decor level one step higher. 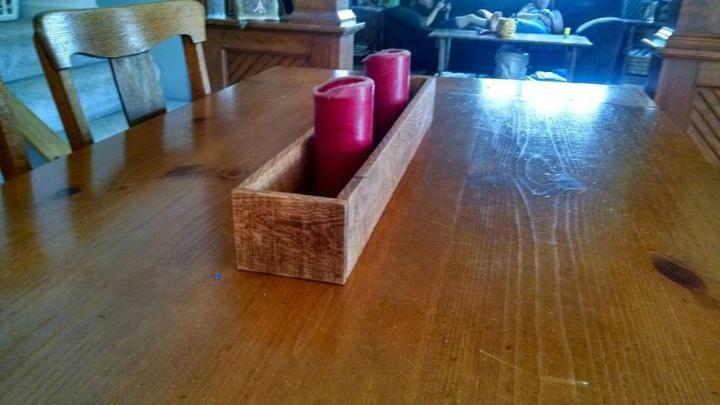 The pallet candle holder are the basic decor thing to be used for the common decor and for the occasional decor and now you can make a rustic holder for the candle out of the pallets and that too at no cost at all. 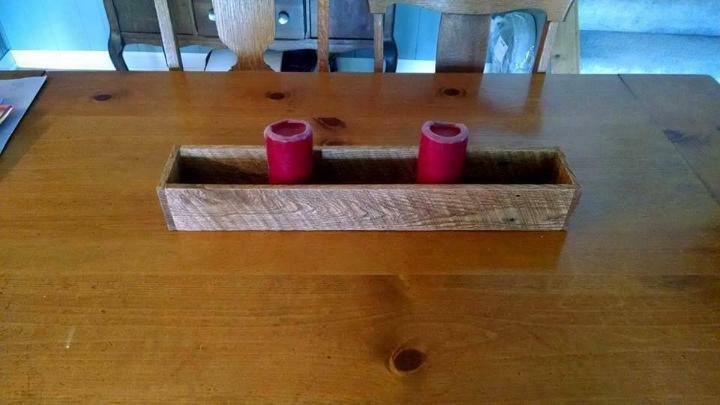 The rustic and yet cute candle holder has been made from a few pallet pieces and thus it would take a very less time and very less efforts to shape up this candle holder at home with your own hands so include it in your next to do list. 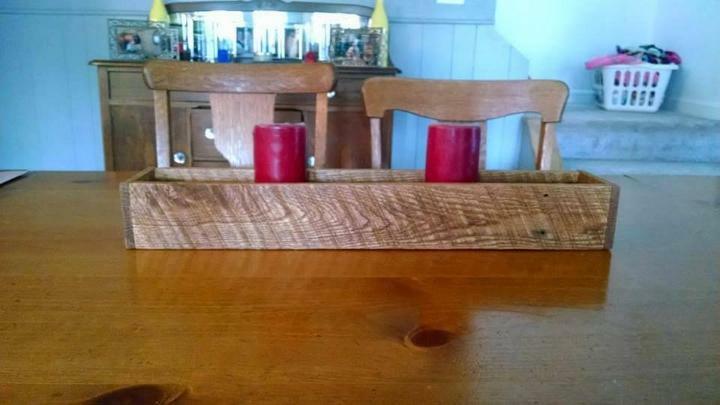 Three large pallet slats have been cut out of pallets to shape up the sides lengthy sides of the holder and the base and two small piece have been used as the right and left sides and accomplish the candle holder and nails and glue have been used to join the pieces together. Though the pallets are already rustic and weathered int he raw form but still this pallet candle holder has been made to look more rustic and traditional with a coat of brown stain on it which would surely elevate the decor level of your house.